When the Most Holy Virgin became three years old, her parents, true to their vow to the Lord to dedicate their child (refer to Sept. 9) to Him, in procession with young maidens "adorned with the beauty of virtues" "with lamps in their hands" and accompanied by relatives and acquaintenances, "with gladness" solemnly led their Most-pure Daughter into the Jerusalem Temple "to be brought up in divine grace" "before the Lord." Though at that time the Most Holy Virgin, as expressed in church hymns, was yet "three years old in the body" she was already "many years in the spirit", although still "a child in the flesh she was already perfect in soul". She looked at the Temple of the Lord as a paradisiacal dwelling of the glory of God, as the most cultivated haven, for which Her soul thirsted more than the home of her parents, and is why she entered into the Temple majestically and rejoicing. 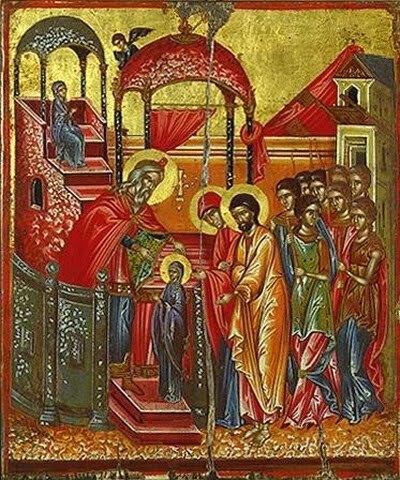 The Holy Virgin was put on the first step of the Temple and to the surprise of everyone, with no one supporting her, being encouraged by the spirit of love for God, climbed firmly up the fifteen steps of the Temple. Invisible angels of God surrounded her and served her. Embraced with priestly delight, the high priest Zechariah, "having blessed, receives" "the holy young Child" "with rejoicing, as the dwelling place of God", and according to a special revelation of God, entered into the Holy of Holies where only the high priest entered once a year. Not only all the participants in this celebration were amazed, but also "the angels were amazed seeing the Most Pure as Virgin entering with glory into the Holy of Holies". Having left their daughter in the temple, Saints Joachim and Anna returned home, rejoicing and thanking God, who granted them the fulfillment of their vow to Him. The Holy Young Child, living in the temple,* spent all her time in prayer, reading the word of God and thinking about God. She occupied half her time with her own needlework, especially loving to prepare clothes dedicated to serving in the Temple; which she fulfilled while growing up, and occupied the other half with works of charity at the Temple, serving the needy, the crippled and the infirm, which tradition says to whom she also gave all her food, herself eating only the "most glorious bread from heaven", brought to her by the angels", and "conversing with them". Living at the Temple and devoting all her time to pious occupations, the Most Holy Virgin was continually in soul and body, in mind and heart, in thought and desire before the all-seeing, omniscient Lord God and His almighty will, having formed in herself a living and firm faith in the word of the Lord, a fervent love for the Lord and for neighbor, an all-perfect fidelity to the will of God, the deepest humility and meekness, inscrutable patience and obedience to the word of the Lord. "Succeeding in wisdom and grace", she surpassed the high sincere qualities of those her age," as St. John of Damascus teaches, "presenting herself as a paradigm of the best and purest life in comparison with others". In the early years of her life she lost her parents. After their death, she all the more turned to the One God with all her soul, and with all the desires of a pure heart and singularly sought Him out for joy and consolation. Together with her growth and strengthening in spirit, she also grew in asceticism in her way of life. With diligence she expanded her meditation about God and through prayer she ascended from power to power, and the gifts of the Holy Spirit grew in her. The "All-holy Spirit has sanctified all things, her dwelling inside the Temple, and eating the heavenly food", "that she may become the divine Throne of the Master of all, His bridal chamber, His resting-place, and His dwelling filled with light", and "become the dwelling place of Him who was begotten of the Father without change before all ages, for the salvation of our souls". As though emulating her heavenly companions in purity and in the foreknowledge of her great destination, she firmly decided to be a Virgin forever and, when she reached her maturity, she wedded herself to God, having made a sacred vow to virginity forever. She became the first virgin in the world, because in the Old Testament up to her time there was still no example that a maiden forever remained unmarried and preferred virginity to matrimony. When the time had come for the Most Holy Virgin, according to the then existing custom, to leave the sacred dwelling of her pious formation and like other maidens to marry, she, "rich in goodness and purity of soul", declared to the high priest and to the priests her vow and with their advice and consent, for the protection of virginity, at that time being 11 years old, was betrothed to her relative, the aged righteous Joseph, and moved from the Temple into his house which was in Nazareth. In continuing her life the Most Holy Virgin Mary, as St. Ambrose of Milan attests, "was virgin not only in the flesh, but also in the spirit, restrained in her heart, divinely wise in her words, not hurried in her speech, chaste in her conversations, offended no one, wished everyone good, and did not shun the poor, and did not ridicule anyone. Her visage was the paradigm of internal perfection; all day long she fasted. Sleep was betrayed only by the demand of need, but also as her body rested, her spirit was awake, repeating in dreams something read or reflecting about some intention not fulfilled, or on some new plans. She left the house only for church, and then only traveling with close relatives. However, although she was outside the house accompanied by others, she was the best protection for herself. Others protected only her person, but she observed the customs by herself". In the church hymns for this day the Most Holy Virgin "is piously praised", as "the most pure virgin", "more honorable and more glorious than the hosts on high", "the preaching of the prophets, the glory of the apostles, the praise of the martyrs, and the renewal of all those born on earth", "the bridal chamber of God the Word", "the dwelling place of the King of All", "the Mother of God", "our glory and salvation". Appealing on this present "joyful day" to "the assembly of the faithful" to this praise of the Most Holy Virgin, the Holy Church together with those present "on this all honorable feast" the example the Saints Joachim and Anna teaches us to fulfill pious vows. And the deeply instructive example of the upbringing of the Most Holy Virgin explains to us our duties to our children that we must as early as possible take them to the temple of God more often, to accustom them to the full complement of prayers at home, teaching them in the law of the Lord, particularly in their growth to properly use their time to develop in them love for their neighbor and diligence to inspire obedience in them to the church rules (Ustav), and to waken and strengthen in them the spirit of piety and the fear of God. The beginning of the establishment of this feast of the Entry of the Ever-Virgin Mary into the Temple is not known with complete accuracy. Saint Gregory of Nyssa (IV Century) first mentioned it. In the IX century St. Gregory of Nicomedia composed the stichera, which we now sing on this feast. Today is the prelude of the good will of God, of the preaching of the salvation of mankind. The Virgin appears in the Temple of God, in anticipation proclaiming Christ to all. Let us rejoice and sing to her: Rejoice, O Fulfillment of the Creator's dispensation. The most pure Temple of the Savior: the precious Chamber and Virgin; the sacred Treasure of the glory of God, is presented today to the house of the Lord. She brings with her the grace of the Spirit, which the angels of God do praise. Truly this woman is the Abode of Heaven. We magnify you, O Most Holy Virgin, Maiden chosen of God, and we honor your entry into the temple. * On the outside in front of the Jerusalem Temple there were about 30 stone apartments, separate one from another, large and beautiful; on them were other apartments, and on those a third (as stories); in all there were 90 apartments, with everyone having a pleasant residence. In these apartments there were rooms for various persons: separately the maidens who lived there during the time they were dedicated to the services to God; separately widows lived there, promising God to keep the premises clean until their death; separately men, called supervisors, in the image of unmarried monks resided there. There were also other apartments for the comfort of pilgrims and strangers who came from a distance for worship in the Temple. All of them served the Lord in the Temple and had their livelihood from the church estates. The Most Holy Child Mary was lodged at the Jerusalem Temple in the apartments where the maidens lived.